Update: We have decided to postpone release of email automation plugin for a week to have some more time to add some cool additional features such as user specific limits, detailed administrator (system owner) reports and Mailgun integration. 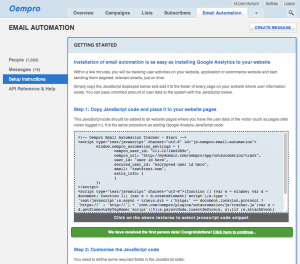 Email automation plugin will be released on 10th Feb’14. That’s right, on 3rd 10th February 2014, our latest Oempro plugin, Email Automation is going to be released. This plugin will make Oempro not only a mass email marketing and list management software, it will also make it a highly effective, next generation email automation system for your and your customers’ business. Email Automation plugin will let your users to set “event triggered” smart emails. This is fantastic solution for any website owner that has membership/user system such as SaaS, e-commerce sites, blogs, forums, etc. Please inform me when your email automation plugin is released with a special price. I need the email marketing plugin with unlimited users. Sure. Please subscribe to our mail list here. Hi a question, the release of this plugin is going to be the 3rd of Feb (today) or the 10th? Felipe, the plugin release has been postponed to 10th, we will be adding two more features to the plugin (Mailgun integration and user-specific (instead of user group) privilege) for easier billing control). Today, we will publish some more screen shots of the plugin and the big day is 10th. With this plugin release, we will also release plugin framework to help third party developers develop and distribute their own Oempro plugins. Yep, it already supports multi-language :) Cheers. Yes, you can change them. I really hope you release on Monday with the framework to develop the new plugins, because we are working on 5 plugins. Yes, we will be releasing a plugin framework right after the email automation plugin. We did some improvements on the plugin engine of Oempro v4.6.2. We will also publish a detailed plugin development manual on our new help portal. Hi!, I hope today the plugin, the framework and the documentation for plugin development. Hello Felipe, the plugin market place, email automation plugin and Oempro v4.6.2 are going to be released today, stay tuned. We will be releasing Oempro v4.6.2 in a few hours. The plugin development framework and detailed plugin development manual will be available later this week.